Prospects for extending the New Strategic Arms Reduction Treaty (New START) appeared to dim in March as U.S. and Russian officials threw cold water on the idea of a quick or easy extension process. The treaty capping deployed strategic nuclear weapons in both countries is due to expire in February 2021, but it could be extended for up to five years by mutual agreement. U.S. officials have avoided expressing a public position on extending the treaty and have expressed concern about Russia’s strategic weapons plans. Yleem Poblete, U.S. assistant secretary of state for arms control, verification, and compliance, told the UN Conference on Disarmament (CD) in Geneva on March 19 that Russia “remains in compliance” with the treaty, but she questioned whether Russia’s development of new nuclear weapons were the actions of a “responsible stakeholder.” One week earlier, Andrea Thompson, U.S. undersecretary of state for arms control and international security, told a Washington nuclear policy conference that the remaining two-year period offers plenty of time to review the pact. According to Lavrov, Russia has put forth “possible solutions,” adding that “it is a question of political will in Washington.” Any such talks would require significant time, Russian officials have said, quashing the hopes of some that the treaty could be extended quickly by a new U.S. president if President Donald Trump fails to win re-election in November 2020. Introducing potential further complications, Lavrov said the deterioration of arms control agreements such as the Intermediate-Range Nuclear Forces Treaty shows that nuclear arms reductions “can no longer be sustained in a bilateral U.S.-Russia format” and that a multilateral process should be launched. Meanwhile, the international community has strengthened calls for the treaty’s extension. Notably, UN Secretary-General António Guterres spoke at the Feb. 25 opening of the CD’s 2019 session to urge the United States and Russia to extend the pact. The treaty is “the only international legal instrument limiting the size of the world’s two largest nuclear arsenals,” he said, praising the agreement’s confidence-building and inspection measures. Contributing to the Trump administration’s consideration of New START, a senior U.S. military official expressed support for the treaty during Feb. 26 congressional testimony. 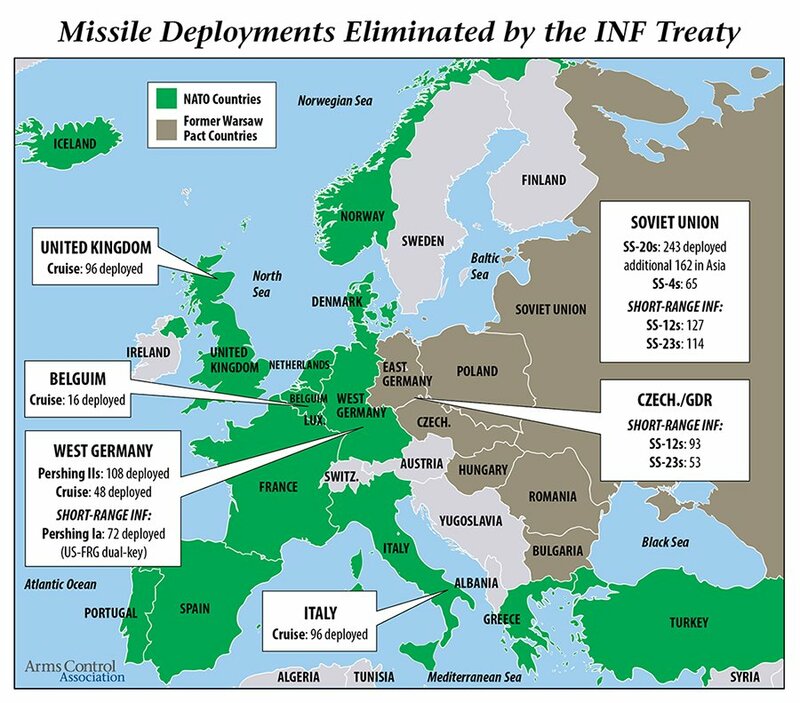 The 1987 Intermediate-Range Nuclear Forces (INF) Treaty led to the verifiable elimination of over 2,500 Soviet and U.S. missiles based in Europe and helped bring an end to the Cold War. But now, the United States and Russia are on course to withdraw from the INF Treaty in six months over a long-running dispute over Russian compliance with the treaty. Termination of the INF Treaty opens the door for Russia and the United States to develop and deploy more and new types of ground-launched intermediate-range missiles–a move that would increase the risks of a destabilizing new missile race. A group of leading U.S. Senators has re-introduced the "Prevention of Arms Race Act of 2019," which would prohibit funding for the procurement, flight-testing, or deployment of a U.S. ground-launched or ballistic missile until the Trump Administration meets seven specific conditions, including identifying a U.S. ally formally willing to host such a system, and in the case of a European country, have it be the outcome of a NATO-wide decision. This bill is a step in the right direction. New U.S. ground-launched cruise deployments in Europe or elsewhere would cost billions of dollars, take years to complete, and are militarily unnecessary to defend NATO allies because existing weapons systems can already hold key Russian targets at risk. Your Senators need to hear from you. The Trump administration announced today that effective tomorrow, Feb. 2, the United States will suspend implementation of the 1987 Intermediate-Range Nuclear Forces (INF) Treaty, and formally notify other parties to the treaty that it will withdraw in six months if Russia does not return to compliance by eliminating its ground-launched 9M729 missile, which the United States alleges can fly beyond the 500-kilometer range limit set by the treaty. This week, 11 U.S. senators reintroduced the "Prevention of Arms Race Act of 2019," which would prohibit funding for the procurement, flight-testing, or deployment of a U.S. ground-launched or ballistic missile – with a range between 500 and 5,500 kilometers – until the Trump Administration provides a report that meets seven specific conditions, including identifying a U.S. ally formally willing to host such a system, and in the case of a European country, have it be the outcome of a NATO-wide decision. Where Do Efforts to Resolve the Compliance Dispute Stand? Since President Trump threatened on Oct. 20, 2018 to “terminate” the INF Treaty, there have been two meetings between U.S. Undersecretary of State Andrea Thompson and Russian Deputy Foreign Minister Sergey Ryabkov (in Geneva on Jan. 16 and in Beijing Jan. 31 on the margins of a P5 meeting on disarmament issues). Neither meeting led to progress. What Missiles Could Each Side Deploy in the Absence of the INF Treaty? As Kingston Reif reports in Arms Control Today, Russian President Vladimir Putin stated on Dec. 18 that if the United States “breaks the treaty,” Russia will be “forced to take additional measures to strengthen [its] security.” He further warned that Russia could easily conduct research to put air- and sea-launched cruise missile systems “on the ground, if need be.” This could include additional numbers of the 9M729 ground-launched cruise missile on mobile launchers. However, key NATO states have already expressed opposition to basing any such systems in Europe. Heiko Maas, Germany’s foreign minister told Spiegel Online Jan. 11, 2019: "Even if we are unable to save the INF Treaty, we cannot allow the result to be a renewed arms race. European security will not be improved by deploying more nuclear-armed, medium-range missiles. I believe that is the wrong answer." Read more about After the INF Treaty, What Is Next?